[N]: This dish needs a little preparation but it is a wonderful warm salad for winter lunches and I cannot imagine a salad of greater nutritional value made from relatively cheap ingredients. You can prepare a large batch and then use it as a packed lunch. You will first need to soak 1/2 a cup of aduki beans. These are lovely ruby red beans and are a favourite of the Japanese cuisine. Now if you need to know how to cook the aduki bean without soaking you may want to check the bbc web site. Next cook about 3/4 cups of quinoa. I used white ones as the colour contrasts well with the ruby red beans. Always wash quiona well before cooking. Quinoa takes about 20 mins to cook, alternatively cook until the grains become translucent. Try to avoid over cooking as it loses the lovely nutty texture. While the quinoa is getting cooked get the following ready – 1/2 a red onion chopped into slices, 1 medium sized sweet potato chopped into small bite pieces, a bunch of winter greens chopped into small pieces. It is important to cut the sweet potato into small pieces to match with the size of the beans. Once the quinoa is cooked wash down both the beans and the quinoa in cold water and mix them well in a big bowl and set aside. This will prevent both from getting overcooked. 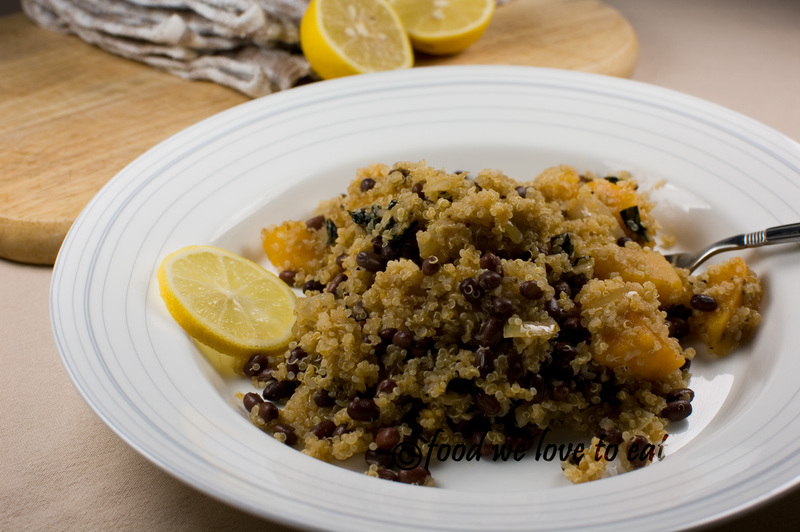 If you want to prepare parts of this dish early then you can always prepare the quinoa and the beans and store this combination in the fridge for future use. For the final preparation fry the onion with some salt and pepper for about 5 mins till it becomes translucent. Add the potatoes and sauté for further 10 mins or until the potatoes are soft. Add the greens and the spices – 1 tsp of smoked paprika, 2 tsp of cumin powder, 1/2 tsp of cayenne pepper. Cook for a further 5 mins. For a sauce mix 1 tbsp of cyder vinegar, 1 tbsp of olive oil and 1 tbsp honey. You can use pomegranate molasses instead of honey and vinegar to make it more luxurious. Add the cooked vegetables along with the dressing to the quinoa-beans and mix well. If necessary dust the salad with a further dash of salt and pepper. This entry was tagged aduki, cayenne pepper, cyder vinegar, healthy, honey, nutritional, olive oil, paprika, quinoa, salad, sweet potato, vegetarian. Bookmark the permalink.